One tester for all your soldering iron maintenance needs. What should you check when doing a daily inspection of your soldering iron? 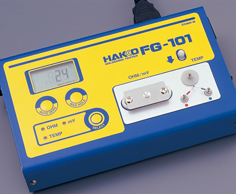 Grounded soldering irons are maintained by inspecting leak voltage, tip-to ground resistance, and tip temperature. Grounded soldering irons cannot be maintained by checking insulation resistance. This method was used in the past in order to find out the level of leak current. What is “Leak voltage” ? Leak current is the current that leaks from the tip to a board or device. Leak voltage is a specific measurement of the level of this current. The leakage can adversely affect delicate devices, so it is necessary to check leak voltage on a daily basis. Most leak current flows from the tip via the ground wire to the outlet ground terminal, and is prevented from affecting the device. Because of this, tip-to-ground resistance is another important issue that must be checked daily.